Home Knife Collecting What Exactly is a Tactical Knife? What Exactly is a Tactical Knife? What is a Tactical Knife? Spyderco founder Sal Glesser once said, a tactical knife is any knife you have with you when you need a knife. Some say custom knifemaker Bob Terzuola made the first tactical folding knife, while others say Ernest Emerson did. Maybe it’s all a marketing gimmick! The term “tactical knife” was coined in the mid-1990s to define a look with certain characteristics. Regarding fixed blades, the characteristics included a non-reflective blade coupled with either no guard or one of stainless steel. Some still use brass and others incorporate titanium for guards, while some use black zirconium. Currently, zirconium’s price deters both makers and collectors. If the price comes down you can expect to see more zirconium for guards. Handle materials should be synthetics, including but not limited to Micarta®, G-10 and carbon fiber. However, these three are far and away the most popular handle materials on today’s custom tactical fixed blades. Over the past century grip materials have evolved from wood, leather washers and even cast brass and aluminum to the current synthetics. In the mid ’90s, primarily Micarta was used. Linen, paper and rag Micarta were the staples of the day. G-10 then came along, offering more colors and configurations. Over the past five years carbon fiber has increasingly become a handle material of choice. The non-reflective blade was accomplished through several methods, the most common being a belt satin finish. As the name implies the finish was applied simply by using a sanding belt. This gave the blade a good-looking surface that was not reflective. Another method was sand blasting. While providing a non-reflective finish, this technique had a problem. The sand created micro pits in the steel. The pits held moisture, leading to blade rust. That led to replacing the sand with silicon glass beads that did not leave pits and produced a more even, flat-gray, non-reflective finish. Walter Brend and BLADE Magazine Cutlery Hall-Of-Fame® member Chris Reeve were early proponents of techniques previously used on firearms to blacken their blades/knives. Chris utilized a black Gun-Kote® finish early on, and Chris Reeve Knives still does today. Brend was asked to produce blades with a black finish and he used Parkerizing to do it. Both finishes were/are subject to scratches. The scratches were especially noticeable when the knife was combined with a Kydex sheath. Today finishes such as those from Cerakote® and other specialty outfits can provide choices not only of color but also of surface designs for your blade. 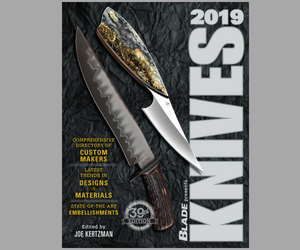 The world’s biggest and best knife show, BLADE Show, is coming to Portland, Oregon, from Oct. 5 to 7, 2018.